The view of the inside rear metal section behind the valves is partially obscured by the amp’s removable back section. You can clearly see three of the bolts right along the top edge; what you can’t see is three corresponding bolts directly underneath, along the bottom. A little bit of one was just visible though (indicated by bottom arrow). For some reason, this bolt was higher than the others. The valves are slanted, so they aren’t a good guide for straightness, and the small valve there is tilted slightly to the right too. By comparing with the four bias-control switches though (four black adjusters mounted on back panel, in middle of image), you can see that this bolt isn’t just mounted slightly high; it’s shifted for some reason to the left too. 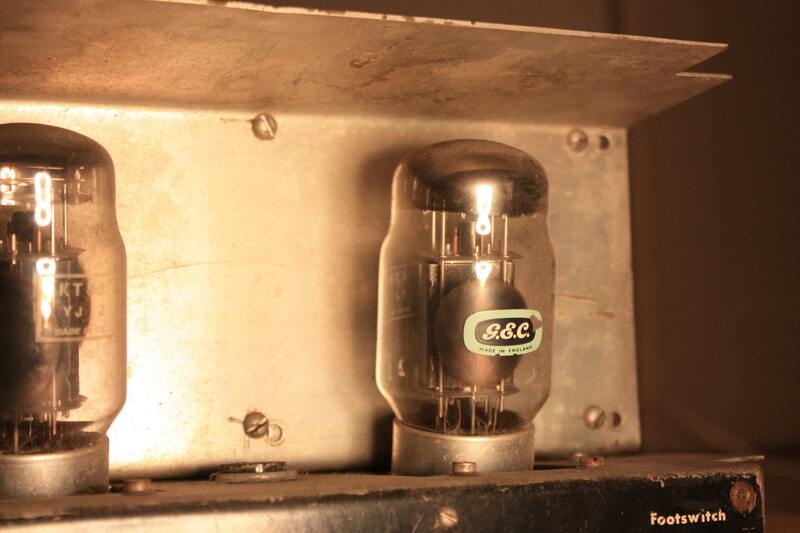 The first pictures of the Swiss amp showed the back, with all the valves. When we started looking into the amp, we requested another one, of the Amphenol connections from the back. This lower bolt wasn’t visible on any of those pics. We now asked for some new photos – with different angles and lighting – to see if it brought out some of the marks (it did). We also asked (without pointing out why) for a photo with that specific small valve removed. This would reveal the hidden bolt, and we asked for one showing both the top and bottom bolt, so we could judge if it was moved over to the left. If it turned out to be either exactly below it, or at the same level, then the top part of the chassis would be different. This explained why that one bolt was partially visible in the black & white 1966 concert photo. For some reason only one of the pre-drilled holes was used to bolt the transformer; new ones had been drilled slightly back, though they had succeeded in forcing one at the top through*. Maybe after a struggle with that one, new holes were drilled for the other three, leaving the inside bottom bolt moved over to the left. The hole (hard to access to drill there) was slightly higher too. The bolts on Paul’s amp are visible in another photo, and you can see that they put the transformer in on that one with no need for re-drilling. 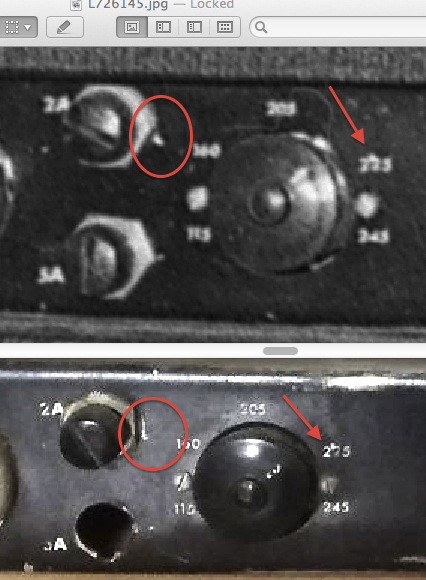 We don’t have clear photos of the bolts on the other non-bass amp, but we can see this re-drilling wasn’t standard. The fact that it’s out-of-position on this amp, in exactly the same way the 1966 photo, isn’t definitive, but it is yet another point to add to all the other points of correspondence. The angle of the slot in the head of the lower bolt, and the one above it, look to be pretty much in the same position too. So does the one on the far left, though the corresponding one to that seems to have turned, loosened/tightened at some point. Moving back to the voltage-selector area, there is another distinctive anomaly. There are numerous corresponding marks here, one of the most obvious ones ringed on the left (with a similar one below it). The anomaly we want to look at though is arrowed, just above the 225 legend around the voltage selector. You can see in the clearer modern Swiss photo below that there was a little nick/production anomaly, a dot just above the central 2 of 225, which matches the anomaly seen on the 1966 photo above it. (The first ‘2’ seems lower also, or the middle one slightly raised). The resolution isn’t perfect, but the screw on the right seems to be in the same position, the left just fractionally loosened/tightened. Note too the fuse legends – the positions on the Swiss amp are reversed in the same way as the 1966 photo, with the 2 Amp fuse on top. (* Carl Nielsen described the huge difficulty he had replacing one of these huge transformers, saying it just wouldn’t go down onto the chassis. He spent almost a whole day getting the old blown transformer out, and trying to force the new one down onto the chassis. When we asked him about these new transformers, he recognised them instantly as being the ‘bloody heavy’ones he’d worked on, which meant the amp had needed two people to comfortably get onto the bench. He said it wasn’t his wiring though, which he remembered – so this wasn’t the amp he worked on).